Easter is just coming around the corner. Due to my recent addiction to making tangzhong breads, I tried to turn this traditional hot cross bun recipe into a Tangzhong version. 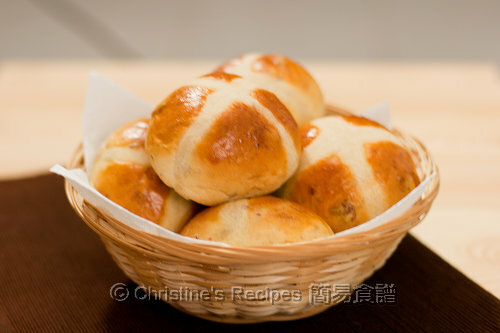 I can make as many hot cross buns ahead, so that I don’t need to get up from bed very early on the Easter morning, because the Tangzhong buns can be kept soft for more days. If you are a big fan of spicy flavoured breads, please adjust the amount of the mixed spice, and add extra hint of cinnamon powder if you like. Select the “dough” mode (please refer to the manual of your breadmaker and select the kneading dough program). When all ingredients come together, add in the butter. Knead until the dough becomes elastic. (Note: my breadmaker has an alert function to remind me of adding fruits or nuts. If your breadmaker doesn’t have any function like this, just put in the raisins 5 to 8 minutes before ending the kneading process.) Then let the dough complete the 1st round of proofing in the machine, about 40 minutes, until doubled in size. Transfer the dough onto a clean floured surface. Deflate and divide into 12 equal portions. Knead each into a ball shape and place on the baking paper, at least 1cm apart. Cover with a cling wrap, let rest in a warm place for about 30 minutes, or until doubled in size. To prepare flour paste: Combine 4 tablespoons of plain flour with 2 tablespoons of water. Stir to a smooth paste, then gradually add a little bit of water at a time if it’s too thick. Spoon into a piping bag and cut away the tip, or fitted with a fine nozzle. Brush whisked egg on the surface of buns. Pipe flour paste over tops to form crosses. Bake for 12 to 14 minutes, or until golden. Thank you for the recipe. I was looking for Tangzhong hot cross buns to make for Easter too. hi christine, these buns are just simply too tempting! beautiful buns! I have to start making buns from this method. Christine, you're really amazing handling this tangzhong method of making bread. These buns look so inviting! Oooo...really got the try these out in the TZ method. A good friend of mine passed me a hot cross bun recipe and it failed on me :(. I know with the TZ method its like a guarantee WIN! Will try these tomorrow...yay!Thanks Christine! Christine! You are really good in making bread! All the bread look so tempting! Happy Easter! This recipe sounds perfect; I will be making these soon, so curious to discover a new bun recipe. 1. Is Active Dry Yeast same as Instant Yeast? Are they interchangeable? 2. I do not have milk powder at home, can i replace the milk powder + milk with whipping cream? Oh wow! Your hot cross buns look absolutely soft, fluffy and yummy! You are fast becoming Tangzhong method expert. Your HCBs look perfect! DELICIOUS! 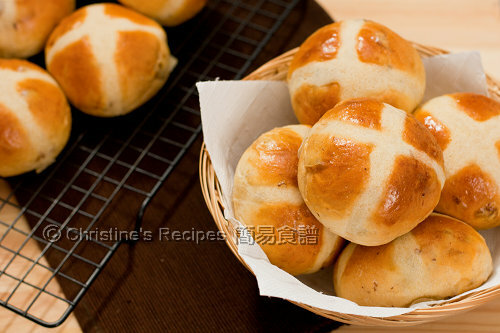 Even hotcross buns can use tangzhong? you are a genius! Wow...Christine, you are becoming a super star in bread making! Your hot cross buns look perfect. I can imagine how soft and delicious they are. Nothing beats homemade bread. Hope you have a wonderful day. 1. Basically, active dry yeast and instant yeast are interchangeable. The amount to be used is more and less the same. If you use active dry yeast, you have to mix it with lukewarm water (below 40C) and a little bit of sugar dissolved in it, to ensure that the active dry yeast will awaken. Wait until foam, or bubbles arise before combining into other ingredients. If you use instant yeast, you can skip the proofing step of awakening the yeast. 2. If you don't have any milk powder, you might omit it. These buns look really good! hi christine, just coming back and let you know that i've posted the pumpkin chiffon cake today, you can have a look, have linked that back to yours, thanks! hi, i think my comments did go thru the second time..just want to let you know that i've posted the pumpkin chiffon cake 2 days ago. Thanks again!! Thanks for your love of my chiffon cake recipe and shout-out! You're also a great baker. oh christine, you're too kind! i would like to try one of your buns recipes too one day!cheers! I've been wanting to try tangzhong method for so long. These look lovely! Happy Easter! What are the ingredient in the mixed spices? 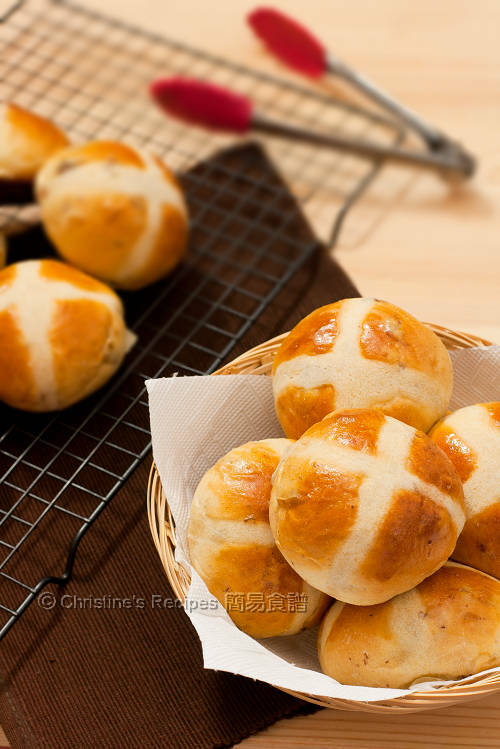 I plan to make these Hot Cross buns for my daughter school's upcoming Easter party, but am afraid that the kids may not like the strong taste of the spices. The buns will be more aromatic if mixed spices are added. But you can reduce the amount or even skip the spices if your kids are not into it. My friend used your recipe for Easter & the buns turned out perfect. However, I don't have a breadmaker. :( How should I alter the instructions if I'm going to knead the dough by hand or with a stand mixer? I'm not sure how long to knead it for (before & after additions of fruits). Just mixing all the wet ingredients with the dry ingredients if kneading by hand, not much difference from using the breadmaker. No matter what way you knead your dough, it should pass the windowpane test, that means the dough can be stretched to a very thin membrane. The kneading time depends on how fast and hard you can knead. Congrats! Lovely buns you've made!